The Procession is a magical creative community event honoring our relationship to the natural world and one another. It offers an educational opportunity to learn more about other species, a forum to express one’s creativity by making masks, costumes and puppets that express the spirit of those species, and a chance to participate in community celebration while building a Triangle tradition. 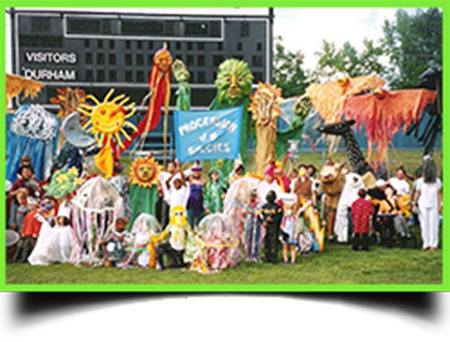 The procession was an integral part of the Durham Earth Day Festivals from 2003-2008. We created and managed a trail building project at Schoolfield Elementary School in Danville, VA that engaged students, teachers, and parents in creating an outdoor classroom on 5 acres of woods that included constructing trails, bridges, benches, and birdhouses as the setting for environmental education. Earth Action Fest was an annual Earth Day event developed and co-sponsored by Eartheal, SURGE, Summit Performance Systems, and a team of dynamic volunteers. Held in Chapel Hill in 2005 and Carrboro in 2006, it included a street march, community participatory events (stream clean-up and bike awareness), and a festival with speakers, music, and vendors offering innovative green and sustainable products and services.